← Catastrophic Failure – Who is paying the price for BHP’s mine disaster in Brazil? Fiji’s decision to purchase military weapons from the Russian Federation and the recent delivery of equipment in 25 containers not only demonstrated the Pacific country’s right to self-determination but also stupefied New Zealand and Australia, among others. International media was awash with varying interpretations to the latest development in this otherwise peaceful region. The Opposition in Fiji cried foul and said that arms had come into the country illegally and that there was no discussion about any military purchases, but none of these would impact on the thinking of the government led by Prime Minister Voreqe (Frank) Bainimarama. According to information made available to us, the seal to the deal was made when Mr Bainimarama visited Moscow in June 2013 and discussed bilateral relations and Fiji’s defense needs with his Russian counterpart Dmitry Medvedev and Foreign Minister Sergey Lavrov. Radio Tarana said that the deal, valued at $19 million is seen as an attempt by Russia to gain a foothold in the Pacific. New Zealand Prime Minister John Key said that he has no issues with business between Fiji and Russia, providing that it is lawful. Fiji’s military is getting an arms upgrade. The dated M16s and M2s used in the 2006 coup will be replaced with what’s believed to be Kalashnikov assault rifles. “The Russians see themselves as a Pacific power. They are trying to get a foothold in the Pacific. Secondly, they want to get access to the region’s resources, such as seabed mining and fishing,” Canterbury University Professor Steven Ratuva said. So a month ago, a massive shipment of arms from Moscow arrived in Suva. And another one is on the way. Fiji’s government did not inform the public of the deal, until the weapons turned up on the dock. But the Defence Minister Timoci Natuva said this is normal practice. “Shifting arms and ammunition across the world, it goes through a safety process,” You do not have to go around calling people that you are providing ammunition for Fiji,” he said. 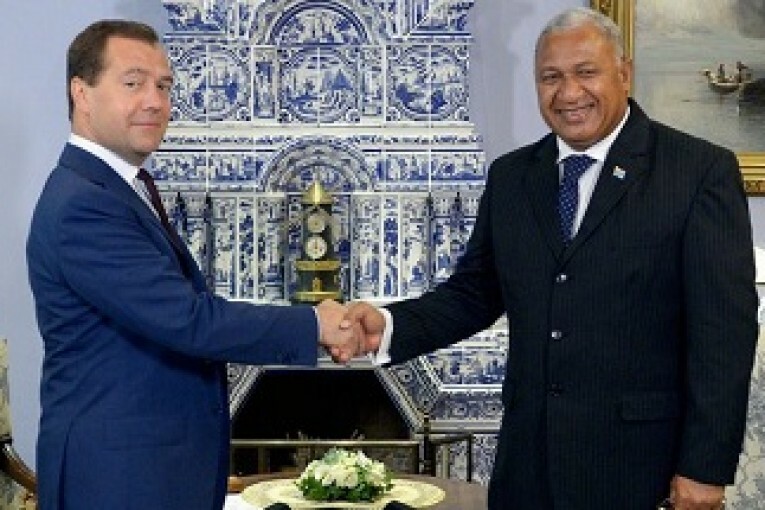 The Fiji-Russian alliance seems unlikely, but it has been gradually developing over recent years. Russia’s Foreign Minister, Sergey Lavrov, indulged in a cup of kava in 2012, during his country’s first-ever high-level visit to Fiji. A year later, Prime Minister Frank Bainimarama went to Moscow, and this is when the Russian arms deal was done. “So it is a new player in as far as the small island states politics is concerned. It needs to establish its presence and expand its influence as well, as a way of telling the world, ‘I’m not gone,” Professor Ratuva said. The weapons are intended for Fijian peacekeepers serving in UN missions, but there are concerns they could be used domestically as well. “The worry is that Fiji has had a history of coups, and with new weapons, it will simply reinforce the power of the military,” Professor Ratuva said. Mr Key said that the arms supply depended on its use. “Our main point really when it comes to Fiji and any Pacific country is that whatever they do with anyone else is a matter for them, as long as they understand that the responsibility rests with them,” Mr Key said. According to him, economic and historical links between New Zealand and Fiji remain strong, despite Russia and especially China expanding their influence in the country. Mr Key described New Zealand’s relationship with Fiji as ‘definitely improving,’ and that he was considering a visit this year. Foreign Minister Murray McCully described Fiji as ‘a major global peacekeeping contributor,’ and hence it was understandable the it would seek to have a well-equipped military. “The military shipment is not, on its own, a cause for concern,” he said. Fiji is more stable today than it was in the troubled years after the December 2006 coup. Fiji First, the party of Mr Bainimarama, obtained a thumping 59% majority in elections in September 2014 and holds 32 of Parliament’s 50 seats. While the opposition is in disarray, the government benefits from an economy growing at 4% a year, as Australians and New Zealanders flock to Fiji’s magnificent beaches. A lively reform programme has won Mr Bainimarama many admirers among his country’s 890,000 citizens. “According to information made available to us…… ” – more details regarding this would be much appreciated. How are arms deals linked to mining the sea floor? does this mean the government will use them to kill of protesters or what? Evidence? Fiji is an independent country and its sovereignty must be respected, Fiji has its own issues and decides independently how to resolve its issues in its own way without external influence. With power comes responsibility.